Four Emory students reached the final stage of competition for the 2019 Rhodes Scholarship, the largest cohort of Rhodes finalists for the university in at least 30 years. 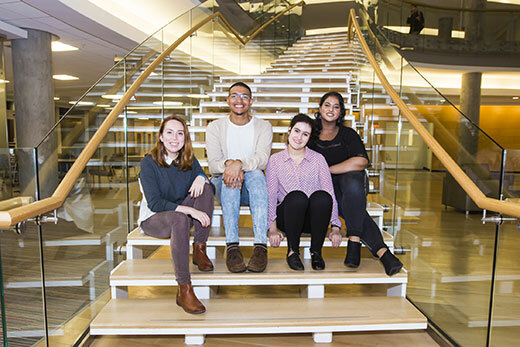 Emory College seniors Lamar Greene, Camila Reed-Guevara, Leigh Schlecht and Namrata Verghese were among 221 Americans selected for Rhodes finalist interviews held Nov. 16-17 in cities around the country. Only 32 were selected to represent the United States as Rhodes Scholars. Emory has had a total of 20 Rhodes Scholars, including 2018 winner Chelsea Jackson. The four finalists came from all corners of Emory College, representing its liberal arts excellence across disciplines as varied as human health for Greene, philosophy and the classics for Reed-Guevara, comparative literature and interdisciplinary studies for Schlecht and creative writing and psychology/linguistics for Verghese. “These students model the ideals of a liberal arts and sciences education fueled by creativity and discovery. They represent the very best of what students can achieve at Emory University,” says Michael A. Elliott, dean of Emory College of Arts and Sciences. “We are extremely proud of them and I look forward to seeing the impact they will have on the world." Greene, of Richmond, Virginia, entered Emory as a Gates Millennium Scholar and immediately became involved on campus and in the community in efforts to reduce health care disparities. He was named a 2018 Harry S. Truman Scholar for his leadership with the Emory Office of Health Promotion (OHP), including leading a campaign on HIV prevention. “My work at OHP has been influential in my thinking and learning the research methods that support my focus on maternal and adolescent health disparities and the role of early intervention to challenge those gaps,” he says. His volunteer work has included serving on the student advisory board of the Center for the Study of Human Health and as a member of the center’s news team. This fall, he presented his research on student health – including information about binge drinking, relationship violence and food insecurity – to Campus Life executive leadership. Greene is also conducting independent research on racial differences in maternal morbidity under the guidance Emory epidemiologist of Carol Hogue at the Rollins School of Public Health. He plans on a career in community-based health and is considering a doctoral degree in public health, to eventually promote health equity on the state and national level. Reed-Guevara, of Salt Lake City, Utah, is a Woodruff Debate Scholar and Mellon Mays Undergraduate Fellow whose commitment to education has guided her research and informed her activism alike. She has chosen to study the classics because she sees ancient philosophy as the framework for ethical behavior today. She founded the undergraduate classics journal, Tesserae, and serves as both president and editor-in-chief. This past summer, a grant from the Fox Center for Humanistic Inquiry and Halle Institute funded her independent research to document the graves of Roman slaves in Italy. Reed-Guevara is now at work on an independent translation of Seneca the Younger’s writings that the inherent humanity of Roman slaves was reason enough for equal access education. She applies such ethical reasoning to her volunteer work with the Atlanta Urban Debate League and a debate program in a Georgia prison. It also justifies her efforts with Freedom University, an Atlanta school that offers free, college-level instruction to undocumented students. A Robert W. Woodruff Scholar from Sheboygan, Wisconsin, Schlecht’s original intention to become an author has shifted to editorially promoting the work of other authors, especially writers of color. Her commitment to exploring the connections between visual art, narrative and social change — and to understanding the social and historical context in which a piece was written — developed after she immersed herself in the collections of Emory’s Stuart A. Rose Manuscript, Archives and Rare Book Library and joined the IDEAS Fellowship, which encourages thinking across and between disciplines. Schlecht has since conducted research in art history at Emory and in theories of text at Rare Book School at the University of Virginia. She also serves as president of Omicron Delta Kappa leadership honor society, as a student investigator on the Emory College Honor Council and copy editor for the Emory Wheel. Her interest in examining diverse perspectives developed from her work as the editorial intern at the Guggenheim Museum and during graduate-level coursework in Latin American literature during a semester of study at the University of Havana in Cuba. She is now conducting independent research on how white student enrollment affects the course dynamic in African American studies classes. “Emory’s support and space to challenge my own perspective has been invaluable to my ability to approach the question of art with a variety of theories, perspective and methodologies,” Schlecht says. Following her studies, Schlecht plans a career as an editor for a trade publisher in order to bring more diverse authors and perspectives to the reading public. A Robert W. Woodruff Scholar who has lived in India, England and the U.S, Verghese has worked across four Emory departments — English, creative writing, psychology and linguistics — to tackle questions of identity, narrative and power. Drawn to Emory for its stellar creative writing program, Verghese found a niche in Emory psychologist Robyn Fivush’s Family Narratives Lab. As a research assistant, she coded more than 1,000 narratives of autobiographical reminiscing. She has since developed an honors thesis centered on the narratives of sexual trauma, with a particular focus on the stories of women of color. The work from both disciplines informs her current writing project, a novel that plays with ideas of epigenetics and inherited trauma through the postcolonial lens. “My work is necessarily interdisciplinary, and Emory’s liberal arts focus has encouraged me to be brave in plotting my life’s trajectory,” says Verghese, whose poems, essays and short stories have appeared in several literary journals and whose short story collection, “Hyphenated,” is forthcoming next year from Speaking Tiger Books. “My classes and research have equipped me with the language to articulate and deconstruct concepts I’ve grappled with my entire life — from who is the subject and who is the other, to who gets to write our stories,” she says. Verghese is a leader in several areas on campus, including as an IDEAS Fellow and as co-editor-in-chief of The Emory Globe. She is co-founder of Model Minority, a multimedia Asian-American identity magazine. Off-campus, she has interned for U.S. Rep. Pramila Jayapal of Washington State, at the Carter Center in Atlanta and, last summer, with Google.